E360 kicks off to a new year. Wednesday marked the first day of E360 classes. Seventeen of 81 applicants from across the Met campus joined us to begin a journey into innovation and entrepreneurship. Wednesday marked the first day of E360 classes. Seventeen of 81 applicants from across the Met campus joined us to begin a journey into innovation and entrepreneurship. In class, these students will spend six hours each week for 24 weeks. They will travel on information gathering trips, be inspired by guest speakers, and learn business concepts - all building a fundamental roadmap for business. Later, with well-developed business plans, E360 participants will pitch their ideas to our student body, and to other entrepreneurs who may see opportunities for investment. Should they, the monies they invest will fuel exciting new ventures. 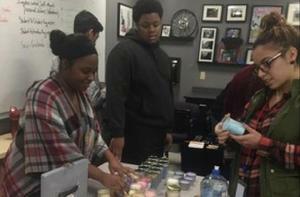 E360 provides opportunities for students to explore entrepreneurial skills and to help bring business ideas to life. “After hearing all about E360, I was a little intimidated. It’s a college level course and I expected it to be a real challenge. It is, but now I'm excited to see what's in store for me at the E-center.” said junior, Jensly Torres.